Baby Hazel Spring Time is the newest baby game with Hazel you get to playand that sounds lovely because Baby Hazel is maybe one of the most popular babies here in the online world of games and we, the administrative team, are really happy to give you the chance to try out a brand new one with Hazel who is always happy to be playing withyou. 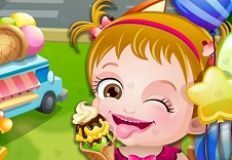 So come and try out this brand new Baby Hazel Spring Time in which Hazel wants to enjoy the summer while it lasts and she has got a lot of activities prepared. 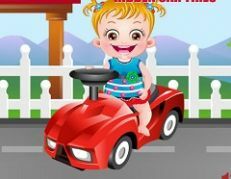 So beside the fact tthat in this new Baby Hazel Spring Time girl game your mission is to dress up baby Hazel, you can also help her play and do all the activities she is always busy with, so she is going to give you all the instructions you need. And because this Baby Hazel Spring Time is indeed a baby game, you have to pay attention what the baby wants and needs. Good luck!